If you’re not familiar with the meat department or rarely purchase beef, going through each cut may be overwhelming, but it doesn’t have to be! Learning about the specific cuts of beef can make meal prep and planning a breeze—and can also save you some moolah. 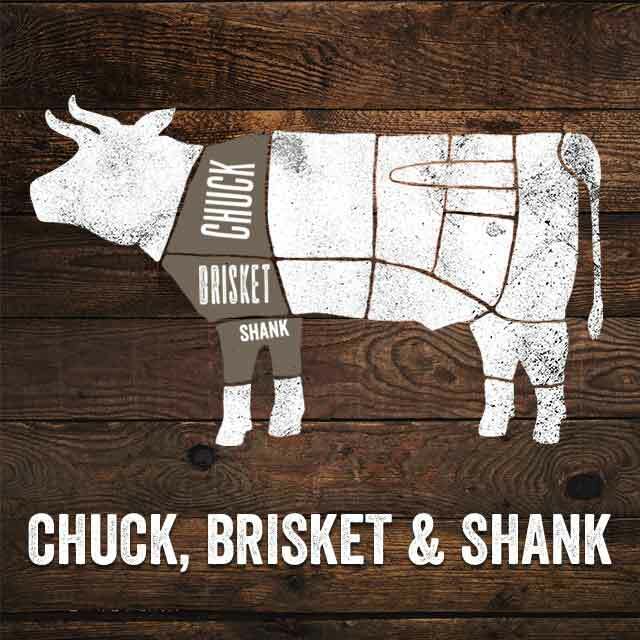 Traditionally less expensive because of their texture, cuts like chuck, brisket and shank stand up well to slower methods of cooking such as stewing, braising and slow roasting. The ribs contain cuts like prime rib and ribeye, which are rich in flavor, incredibly juicy and because of their significant marbling have a delicate tenderness. Prime rib is ideal for roasting and is typically reserved for special occasions and holidays. Ribeye is a full-bodied, hearty steak with complex marbling and versatility—great for grilling and pan frying. The plate (or skirt) is less expensive because of its texture and fat content, and works well in stir-fries, fajitas and sandwiches. Preparation is less involved with this cut and is best sliced thinly. The loin contains cuts like the T-bone, New York strip and filet mignon, and are known for their marbling, tenderness and flavor. They are best grilled, gently sautéed and slow roasted. The flank is lean and an unbelievably flavorful cut. It’s best marinated, grilled and thinly sliced. The last quarter of the cow’s cuts are similar to the first. Cuts like round and top round are full-flavored, best used for roasts and should be cut against the grain after cooking. Economical cuts are perfect for weeknight dinners because they require less hands-on time and develop deep flavor gradually. Now that you’re an expert, head to The Butcher Shop at Sprouts for quality beef and unbeatable value, guaranteed. Our skilled butchers handcraft our all-natural, always fresh, never frozen beef for you daily. They’re ready to help you with product selection, cooking tips and custom cuts. Just ask!